Operates on a rechargeable lithium battery (included) or on 3 AAA batteries for backup (not included). This sturdy radio is a must-have in every home and makes a great gift for friends and family you want to keep safe! During the past year, thousands of Americans discovered the many, many ways that The Franklin Prosperity Report can make you money (as well as save you money) without making any major life changes. We'd like you to benefit from this useful report. Each month, The Franklin Prosperity Report comes chock full of money-making and money-saving ideas. The editors of The Franklin Prosperity Report scour information from the world's best experts to find out how you can make more money. An easy way to check out charities . . . plus great local charities most people forget about. Secrets of withdrawing money from your IRA without penalty . . . including a great tip for buying or building your first house. Five reasons to skip retail credit. Important tips for buying long-term care insurance. How to avoid getting ripped off for auto repairs. How to slash your mortgage payments without unpleasant surprises in a few years. All of this terrific information is in just one issue of The Franklin Prosperity Report! IMPORTANT NOTE: Sales tax included where applicable. Your trial subscription comes with convenient automatic renewal. At the end of your subscription, we'll notify you. If you want to keep the publication, do nothing and we'll renew your subscription using your credit/debit card on file. 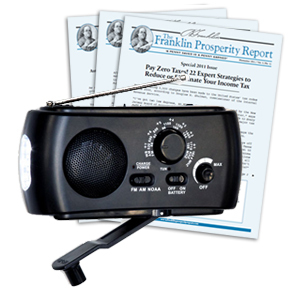 We'll charge you $49.95 (or $47.95 for digital) for one year (12 issues) of The Franklin Prosperity Report and thereafter at the lowest rate then in effect. There is no risk, you can cancel within the first six months for a full refund of the unused portion of your subscription. Your family's safety and security are essential. Every home should have an emergency radio in the event of natural disasters such as hurricanes, tornadoes, earthquakes, electric power outages and even terrorist attacks! The Franklin Prosperity Report is dedicated to helping its readers save money each month with creative ways to cut your costs on groceries, insurance, travel, and everyday expenses.